CHRISTCASTMAS HITS LIKE A TON OF BUTTER! 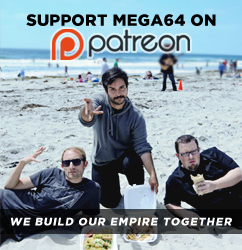 It's been one year since we started the Mega64 video podcast. We have taken you to such fun places as...Disneyland, Las Vegas, San Francisco, Seattle, Toronto, Scotland, and of course Victorville! In our minds there was no better way to say thank you to all our fans than once again try to eat things that you never really should! To hear the all the barfing click here! Or to see it in all it's pink glory, watch below! We have one more matter to discuss on this day; the fact that you guys came though and got us nominated for the Screw Attack Awards! We are up for Best Gaming Show, and Best Gaming Podcast! Okay guys we got this far. Now lets tell everyone to vote for us everyday until voting ends on Sunday. Since Christmas is on Thursday it's a perfect chance to tell the family including Grandma Marley to vote for us! Here is the link... go vote! That's it for now, we have many other exciting announcements on the way so make sure to check back...and soon!